Taking a Roman coin stamped with Caesar’s image, Jesus answered, “Render to Caesar the things that are Caesar’s, and to God the things that are God’s.” (Matthew 22:21) This reply caused all parties to marvel. We should too. All humans bear God’s image. We are all ultimately accountable to God. But we also owe our lesser allegiance to authorities on earth. Jesus' message profoundly shapes our thinking about governance. Rulers are accountable to God, but are not subject to religious authorities (unlike Popes installing Medieval rulers). Islam produces Caliphates, or an Islamic Republic like Iran, accountable to a supreme religious ruler. But Christianity recognizes parallel governing authorities. Each is ultimately accountable to God, but each functions separately, exerting cultural influence and power. A Christian individual can honorably serve in government as a noble calling. But there is no “Christian political party” nor a “Christian government.” Despite the highest of puritanical intentions, there is no “Christian Taliban” to control citizens’ lives. A grad school professor, Dr. Robert Godfrey, used a helpful illustrative diagram. God has appointed three spheres of influence. 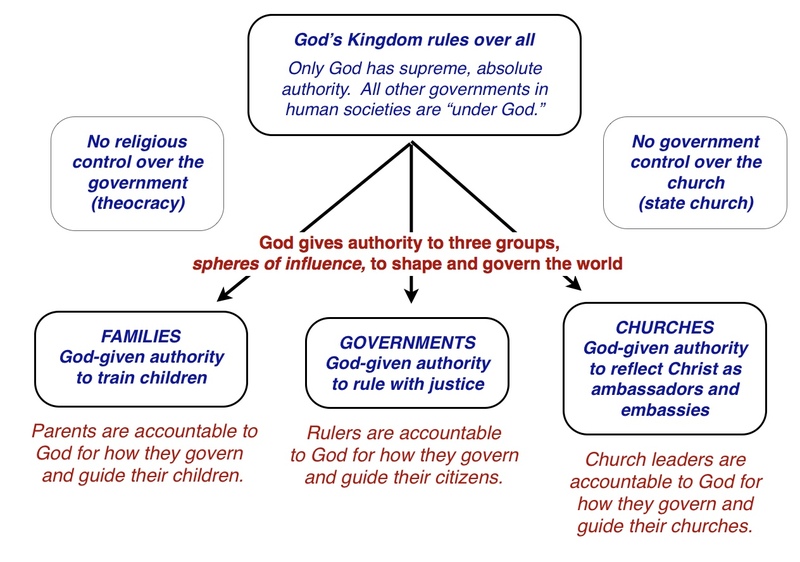 Each shape and govern the world: the FAMILY, STATE, and CHURCH. Each influences the others (for good or ill). Each is ultimately accountable to God, but not to the others. The church should speak gospel truth to power, but does not control the affairs of state. Nor should the state seek to control the church or regulate the family. This framework should shape our debates. What is the responsibility of parents? Of governors? Of Christian ministers? Can Christian legislators advance legal protections for the lives, both born and unborn, as well as the civil rights, of all citizens in their nation? That includes MeToo victims, public school students, citizens of color, and God's image-bearers in the LGBTQ community. How should God’s command for his people to welcome foreigners impact a nation's immigration policy? Can Christians honor a ruler’s office, and pray for the office holder — but also challenge and not justify — that ruler’s character, morality, and behavior?